What’s this, you ask? Oh, it’s nothing. 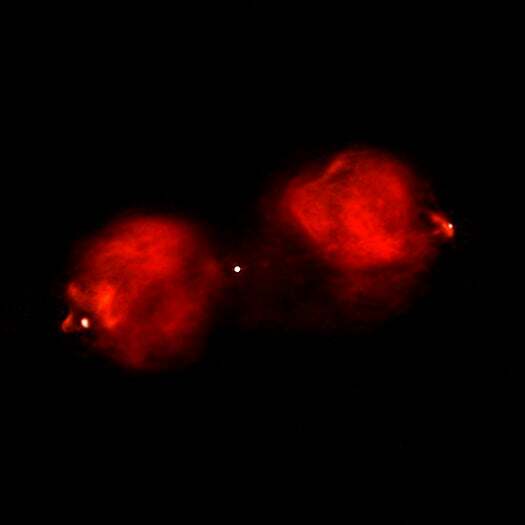 Just a supermassive black hole blasting a giant x-ray beam over a 300,000-light-year-wide gulf of intergalactic space. That’s right: you’re looking at a composite image of a tremendous cosmic blast, pieced together from 15 years of observational data collected by NASA’s Chandra X-Ray Observatory and the Australia Telescope Compact Array. 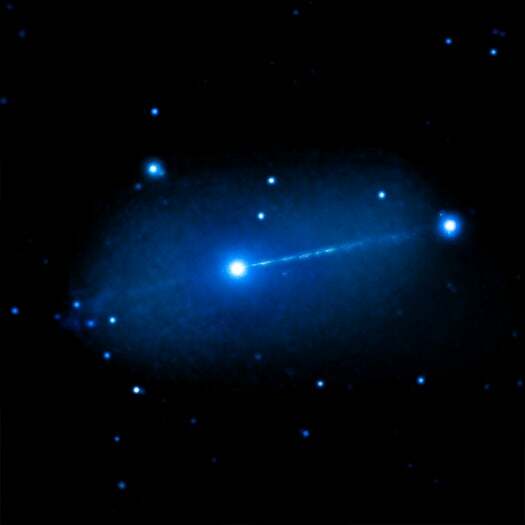 In it, an x-ray beam (blue) jettisons away from the black hole sitting toward the centre of Pictor A, a galaxy located 500 million light years from Earth. Other prominent features include a “radio lobe” (red), where the x-ray beam is pushing into the surrounding interstellar gas, and a bright “hotspot” at the leading edge of the jet, caused by supersonic shock waves. Now, this situation may strike you as somewhat alarming. But NASA assures us that intergalactic laser blasts are a perfectly normal — in fact, expected — outcome of living in a universe filled with massive invisible objects that ruthlessly devour light and matter. When cosmic material swirls toward the event horizon of a black hole, it releases a huge amount of gravitational energy. Every so often, some of this energy is re-emitted in a jet of particles that whiz off into intergalactic space at close to the speed of light. Our own friendly neighbourhood black hole, Sagittarius A*, has had similar outbursts over the ages, including one six million years ago that could have impacted life on Earth.